The ‘Remotely Operated Vehicle’ (ROV) Genesis of VLIZ spent the last two and a half weeks in the Spanish Mediterranean aboard the Spanish research vessel Sarmiento de Gamboa. Commissioned by the Royal Netherlands Institute for Sea Research (NIOZ) the underwater robot carried out visual observations of the seafloor and the overlying water column in the wake of the Apollo II, a crawler developed for deep-sea mining activities. Photo: A look in the control room from where the VLIZ-ROV was controlled. 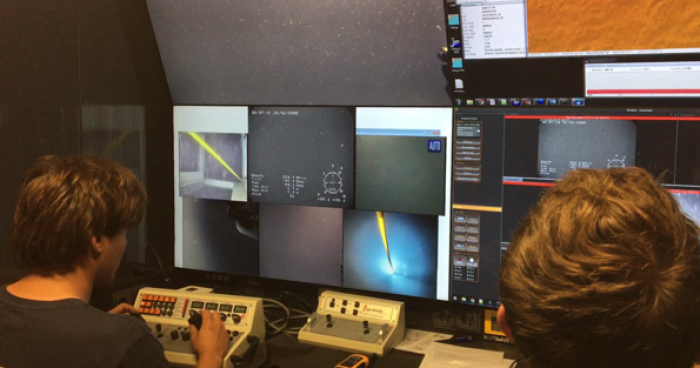 During the two and a half week trial cruise, the ROV carried out no less than 12 dives, averaging each two hours and this to a maximum depth of 300 m. Two pilots and two navigators were responsible for operating the robot from a control room on the deck. The researchers collected a lot of pictures and video footage that now will be processed further. The campaign was part of the Blue Nodules project, funded by the EU within the Horizon 2020 program, and focused on testing the technical performance and environmental effects of the mining crawler Apollo II built by Royal IHC.